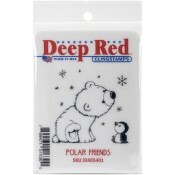 Deep Red Stamps rubber stamps are beautifully detailed and made with a proprietary blend of high grade natural gum rubber. This means better ink transfer so you get fantastic impressions on a wider variety of surfaces and papers. They are durable and safe to use with any crafting inks.